I made a slight modification to Jeanine’s End of Summer Peach Pie Smoothie by adding a little ghee because I was feeling the need for additional healthy fats and have been on a ghee kick lately. I also removed the “End of Summer” from the name because you can make this anytime of the year. It’s definitely a dessert worthy smoothie. “Yogurt been called the original health food. It boosts your immune system, helping fight infections and ward off colds and flus. It provides half of your daily requirement for calcium and vitamin B12 and pitches in a good 10 to 12 percent of your daily need for magnesium and potassium. The spices take this smoothie to another level of healthiness. Fire up your blender and get ready for a party in your mouth! Place all of the ingredients except the cinnamon into your blender and blend for around 30-45 seconds or until nice and smooth. Pour into your smoothie glass and sprinkle the cinnamon on top. 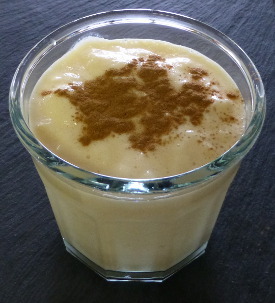 Jeanine and I would love to know if you try this peach pie smoothie and how you liked it. Please leave a comment below. Happy Blending! Hi,your peach pie smoothie looks so good and i would like to make it but the carbs and sugar seems pretty high.if i left out the honey or maple syrup and use stevia in your smoothie would that cut back on the carbs and sugar in your smoothie.i am a diabetic and i don’t use honey or maple syrup.i use stevia powder or liquid in my smoothie recipes.i have a magic bullet blender for 1 person to use to make healthy smoothies. Using stevia instead of maple syrup or honey is what I would have recommended to reduce carbs/sugar, Kim.